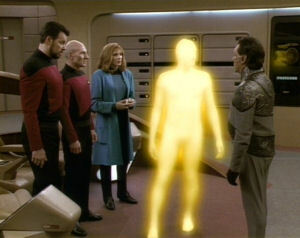 Dr. Crusher falls for an amnesiac patient with strange healing powers who appears to be mutating at an alarming rate. Christi Henshaw, Geordi's crush, looks a lot like Leah Brahms. Coincidence? The make-up work on the crashed John Doe is surprisingly gross, what with the brain and teeth exposed like that. The scene on the bridge with Picard idly holding the little blue computer capsule is awkward. Why is he holding it? Then, later, Geordi is trying to figure out how to read the data on it, while sipping drinks with Worf in Ten Forward. Why isn't the capsule in Engineering, being scanned and analyzed? I'm going to draw the line and say this episode doesn't count on my list of episodes in which a member of the crew is subverted by an alien influence, even though Geordi's state of mind is obviously altered by John Doe. Worf trying to teach Geordi about women is priceless. Those long range sensors are unbelievably good. They are able to detect and analyze a ship that is over ten hours away at Warp 9.74? With sensors like that, how does anybody without a cloaking device ever get the jump on them? Amnesia is a crutch of a plot device. Even when it's used well, it tends to come across as sloppy writing. I'll try not to hold that against this episode. It's a good thing John Doe doesn't turn out to be evil or dangerous. People seem way to willing to believe that his amnesia is sincere and that he is a good person. The weapon the Zalkonians use that somehow manages to cripple the entire crew, save Data and John Doe, is one of the most effective and efficient weapons we've seen so far on this show, but it's used with very little fanfare or explanation. I like that the show is trying to explore the evolution of an alien species that is on the cusp of becoming something more omnipotent, because we've seen extremely advanced aliens before (like Q, for instance). However, this is kind of a ho-hum episode. Maybe it's just because the season is coming to an end and the cast and crew are exhausted, but the episode comes across as uninspired.